Do you enjoy the open air freedom and al fresco dining of camping, but dislike all that unpleasant cold, hard floors and crouching? Try Glamping! Here are 10 holiday parks and campsites offering Glamping, Isle of Wight style. We also did a price comparison for a week Glamping in the school summer holidays 2016 for 6 people. Whitecliff Bay is a well-equipped Isle of Wight holiday park, similar to the Isle of Wight's four Park Resorts/Parkdean Resorts sites (see below). In my view, its best feature is its easy access to the beach (called Whitecliff Bay unsurprisingly) which is stunningly pretty on a sunny day and generally isn't too busy as it is mostly just used by residents at two holiday parks. Glamping The Wight Way is in the sleepy West Wight - the kind of place where people go surfing in their lunch breaks and where you're likely to encounter a cow in the road. There are four 'canvas lodges' in a rural spot, near the River Yar and half way between Yarmouth and Freshwater. The accommodation is certainly one step up from a posh tent, with proper bathrooms, wood burning stoves and separate rooms (albeit with thin walls). They can sleep up to 8 people, although 6 people is probably a more comfortable option. As long as you aren't a vampire, you might like the yurts at The Garlic Farm in Newchurch (nearish to Sandown). They've got a king size bed downstairs and then single beds upstairs on a mezzanine level. Each yurt has its own kitchen and toilet/shower, so there's no wandering across the campsite at 3am when you need a wee. They've also good woodburning stoves, although I can 100% guarantee that the sun will shine every day and you won't need to even bring pyjamas* You can just about cram 5 or 6 people into most of them, but it looks like they would be ideal for 2-4 people. The Garlic Farm is a working farm but it's also a pleasant tourist attraction with a cafe, farm tours and a small playground. I'd say Buttercup Barn Retreats just about counts as Glamping, even though the accommodation are more huts than tents. Each hut is big enough for two people, so it's more aimed at couples looking for a weekend in a hot tub than at families with seven children. ​Thorness Bay is a family friendly holiday park near Cowes which usually comes out as the cheapest of the four Park Resorts/Parkdean Resorts sites on the Isle of Wight (see our price comparisons of caravans and camping). ​The park has got pretty much exclusive access to a scrubby beach which has top notch sunsets and seems to be popular with anglers. It's not really a swimming beach, but Thorness Bay does have an indoor swimming pool, which I would imagine would be more appealing unless you happen to be a fish. Thorness Bay is bordering on being remote, as there isn't really a lot else around it. It is certainly a quieter coastline than the Isle of Wight's south east coastline (Sandown and Shanklin). Personally, I find that quite appealing and the Isle of Wight is small enough that you can get anywhere from Thorness Bay within 45 minutes (and most places within 20 minutes) assuming you bring a car. The Glamping options with Park Resorts/Parkdean Resorts are described as Safari Tents, although I'm assured that there is only a minimal risk of waking up to find an elephant in your bed and a tiger tucking in to your Frosties. The luxury tents are big enough for six and come equipped with a proper kitchen (rather than those dumpy little camping gas things which campers have to battle with). There aren't toilets and showers, but you have access to the communal facilities used by campers and tourers. If you'd rather be in the thick of it, then I'd pick Lower Hyde over Thorness Bay for glamping. ​Lower Hyde is in Shanklin, which is a pleasant holiday resort town with twee little thatched tearooms and an economy which relies heavily on demand for bright orange plastic buckets in the shape of castles. Glamping at Lower Hyde is very similar to the other Park Resorts/Parkdean Resorts holiday parks with well equipped Safari Tents for parents who are far too sensible to agree to the endurance sport of camping. The posh tents include proper beds and a proper kitchen, although toilets and showers are shared with the rest of the campers. In my humble opinion, Lower Hyde has the biggest range of facilities of any holiday park on the Isle of Wight with indoor and outdoor swimming pools, a sauna and spa, an adventure playground, restaurant and bar, sports court plus various daily entertainments to keep children occupied. A happy compromise between the peace and quiet of Thorness Bay and the seaside jollity of Lower Hyde is Nodes Point. It is a few metres from a rather nice stretch of coastline which specialises in ankle deep water (St Helen's beach is so shallow that at certain times of year you'll see people attempting to walk out to the Victorian fort in the middle of the Solent). It is also near the ferries at Ryde and Fishbourne. Nodes Point is a busy family type park with an indoor pool and sports court, as well as an adventure playground as well as a restaurant and bar. It lacks an outdoor pool, but my feeling is that you'll either want the warm water of an indoor pool or the plucky British tradition of splashing around in the sea and pretending you aren't screaming inside. The glamping tents are similar to those at Lower Hyde and Thorness Bay with enough space for six, comfy beds, a full kitchen but no toilets or showers (you'll share the communal ones). Tom's Eco Lodges are part of the Tapnell Farm site which was a working dairy farm but is now home to more exotic animals as part of Tapnell Farm Park. It is also part of the site which hosted the 1970 Isle of Wight festival when vast numbers of barely clothed hippies and free spirited sorts watched jimi Hendrix and The Doors perform. It's a much quieter option than Holiday Park Glamping, but there are some children's activities which you have access to including a playbarn and a jumping pillow (bit like a bouncy castle). Tom's Eco Lodges include various quirks such as outdoor hot tubs and chickens which provide daily eggs. Each lodge has enough space for 8. Price comparison: a tent which sleeps 8 is £1339* during the school summer holidays, which is the equivalent of £1004 for 6 people for the purposes of our price comparison. Windmill Campersite sits somewhere between our quirky accommodation guide and this glamping guide. Actually it is somewhere near Carisbrooke Castle, but you know what I mean. 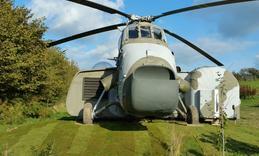 They've got camping 'pods', a couple of shepherds' huts and er, a Falklands-era helicopter called Galahad. Other semi-luxurious quirks include a musical solar powered 'ShowerShack' and a BBQ/pizza oven called 'Big Bertha'. ​Price: 4 nights in the 4 berth helicopter was £455 during August 2017. For the purposes of our price comparison, that would work out as £1194 for 6 people for one week. Woodland Retreat is a small glamping spot in the Wootton area (nearish to the 1969 Isle of Wight Festival site where Bob Dylan headlined). 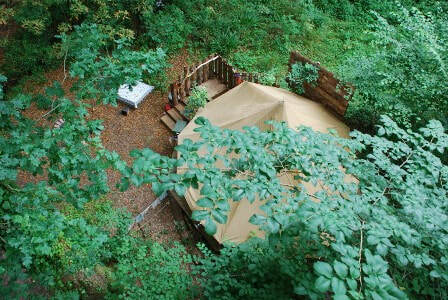 It's got two bell tents which sleep up to four people and a woodland cabin for four to six people. You can also sign up for yoga, bushcraft and artsy things at this one. I'd say it's a more authentic and rustic glamping experience than you'll get from a safari tent at a holiday park. It's ideal for those who've always fancied pretending they are a squirrel, but don't turn up and ask where the swimming pool is. Price: ​£497 for four people for a week in August 2018. So, for our price comparison we worked out the equivalent price for six people as £745. Wight Glamping Holidays is in Arreton and offers lotus bell tents, which have slightly higher roofs than a normal bell tent, apparently. Each tent has space for four people (or maybe 5) and a kitchen attached to the back. Wash facilities (and presumably toilets) are a short walking distance away from the tent. The site is a little way inland so is a good option for the Isle of Wight Festival. Price: £455 for four people during the school summer holidays in 2016, so equivalent of £682 for 6 people for the purposes of our price comparison. Buttercup Hideaway is another Glamping option in a very rural location - it is sort of half way between Godshill and Niton towards the Isle of Wight's south coast. Their 'canvas cottages' have fitted kitchens with beds for six people. There's a 'vintage flushing loo' (not so sure about that) and hot showers available in the farm buildings. Price: £595 for 5 people during school summer holidays 2016, so the equivalent of £714 for 6 for the purposes of our price comparison. Glamping is only a small part of what's on offer at Ventnor Botanic Garden and they don't make a song and dance about it. It's only available in July and August and it involves tipis with the option of hiring a hot tub if you feel like an outdoor bath. The gardens itself are one of the South Wight's attractions with various plants and flowers which wouldn't normally grow in England. It was once the site of the country's tuberculosis hospital because of the warm sea air. Ventnor Botanics is also near to Steephill Cove, which is a lovely little bay where I once had a very nice tea cake. Price: £840 for a week for a 'family', although I'm not sure exactly how many that is for. I guess it depends how close you are willing to get. Kids Love Yurts is in Newport (in the middle of the Isle of Wight) and is aimed at parents who fancy an outdoors holiday, but can't quite face bringing all the equipment and accessories that come with camping with young children. Their posh yurts come with bunk beds and ensuite toilets and they are also decked out with children's toys and general cuteness. We worked out the equivalent price for 6 people where a suitable option wasn't available. We looked for any week during the school summer holidays 2016, so any time in late July or in August. We searched in early June 2016, unless otherwise stated. **Searched in October 2016, apart from Kids Love Yurts, Buttercup Barn Retreats and Whitecliff Bay which we added in 2017 and Woodland Retreat, which we added in 2018. If a six berth wasn't available, we found a 4 or 8 birth and got the calculator out.